See that man? He’s the NBA’s newest superstar. Most people see getting swept in the first round of the playoffs as a bad thing. With players like Anthony Davis, it’s nearly impossible to look at the New Orleans Pelicans situation in a negative light. The young squad from the big easy lost four quick games to the top seeded Golden State Warriors this past week. While the Warriors didn’t have many problems getting the sweep, they had their fair share of issues with the unibrowed monster otherwise known as Anthony Davis. The pessimists will have their opinions on the quick first round exit, but the optimist is the one you should be listening to. In game four, the 22 year-old Davis had 36 points and 11 rebounds and left the Warriors searching for any possible way to stop him. The optimist puts his attention here and towards the future. Forget the sweep. Focus on the fact that the future of the franchise just averaged 31.5 points, 11 rebounds, and 3 blocks a game against the best team in the NBA. Focus on the fact that the Pelicans were four games out of a playoff spot with a month left and managed to fight and claim the eighth seed in a strong Western Conference. Focus on the fact that the Pelicans did this without any veterans on their roster. Not one player on this team was over 30 years old. So as the pessimist claims this team lacked poise throughout the year, the optimist can counter with the awesomeness of succeeding without a veteran presence. The pessimist will question if Monty Williams is the right coach to join Davis in leading NOLA to the promiseland. The optimist can raise the point that LeBron James went through four different coaches before getting his first ring. You can go back and forth all day long. The bottom line is the future is finally here for the Pelicans, and this year’s first round series versus Golden State was the first sign of great things to come. Anthony Davis is the next great one. Need proof in the form of numbers? Davis joined Wilt Chamberlain, Bob McAdoo, Kareem Abdul-Jabbar, and Willis Reed as the only five players in NBA history to average at least 30 points and 10 rebounds for their first four playoff games of their careers. Come July 1, I have no doubt he’ll have a max contract waiting for him to sign so the Pelicans can lock him up. Sure the Pelicans were a one-man team for many parts of the season. Davis’ supporting cast was not always up to par. But c’mon, release your inner optimist. Davis and the Pelicans are here to stay and entertain us for years to come. 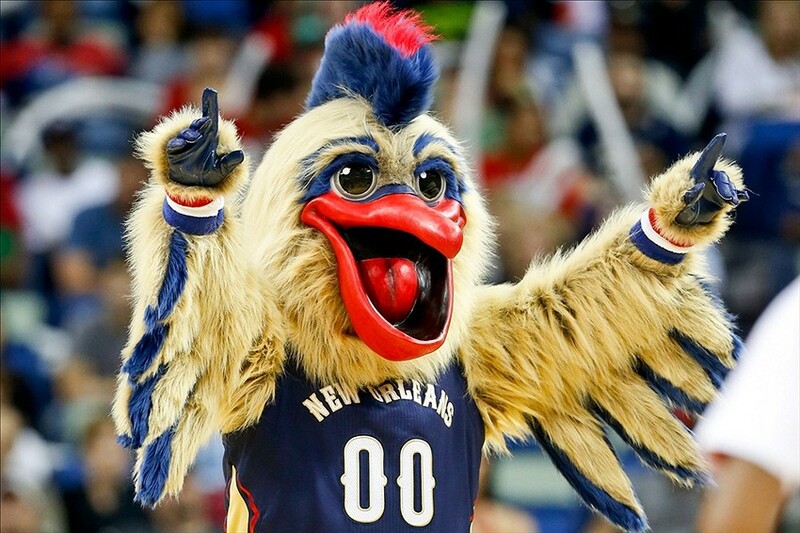 And that means we get to see more of Pierre the Pelican. Not even a pessimist can be mad about that.